As a Respiratory Therapy student, you will definitely need to know the process of oxygen and carbon dioxide transport. This a topic that you will cover in detail within your cardiopulmonay anatomy and physiology course in Respiratory Therapy school. This is why it’s so important that you learn and understand it now, so that you will be all set when you need to use this knowledge from now on. 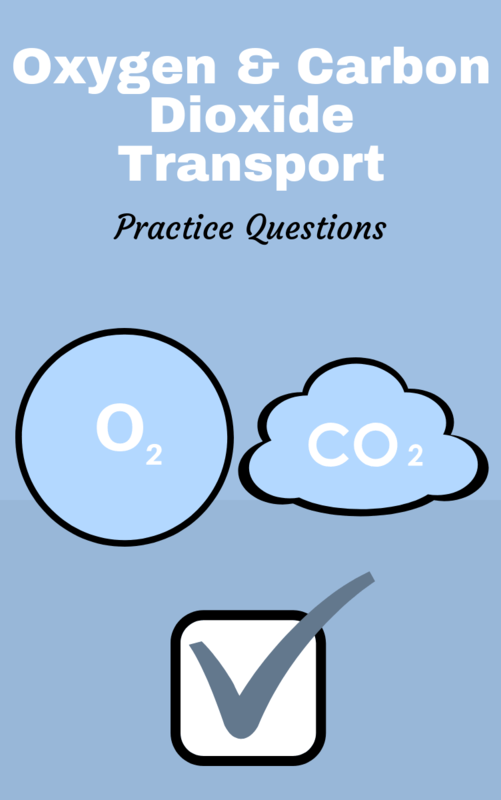 To help with that, we put together this study guide that is loaded with practice questions all about oxygen and carbon dioxide transport. You can use this guide to help you learn until the information sticks. So enough blabbering from me, are you ready to get started? 1. How is oxygen transported in the blood? By binding to hemoglobin in the erythrocytes to form oxyhemoglobin. 2. What oxygen is bound to in the blood? 3. What carbon dioxide is bound to in the blood? Bound to hemoglobin and moved as bicarbonate (HCO3). 4. How long does it take oxygen to equilibrate in the capillary of a healthy person? 5. What is the red blood cell safety factor in the capillary? 0.75 seconds and with exercise, and it can be as low as 0.25 seconds. 6. What happens to the PO2 diffusion time in a damaged lung? The RBC can take the entire 0.75 seconds meaning that it has no safety time left. It will take longer to oxygenate the RBC. 7. What is systemic venous blood? The blood that is in the systemic system that is heading to the lungs. This blood is de-oxygenated and needs to be reoxygenated. Oxygen is 40 mmhg while carbon dioxide is 45 mmhg. 8. What happens in the pulmonary capillaries? The oxygen of 40 mmhg is re-oxygenated to 104 mmhg. While carbon dioxide that was 45 mmhg becomes 40 mmhg. 9. What happens to systemic arterial blood? It drops slightly after being re-oxygenated in the lungs from 104 to about 95 mmhg. This is due to aorta blood in the bronchiole tissue. 10. What is the standard diffusion gradient for CO2? 11. What is the diffusion gradient for O2? 12. Why does CO2 require a smaller pressure gradient than O2? CO2 is 20 times more soluble than O2. 13. What is the arterial end of CO2 entering the capillary? 14. What is the partial pressure of carbon dioxide (PCO2) that is entering the capillaries of the lungs? 15. What is the arterial partial pressure of oxygen (PO2) at the peripheral tissue? It is 95mmhg of oxygenated blood that arrives to the tissue from the heart to the lungs. 16. What is the venous PO2 at the peripheral tissue? It is 40 mmhg because the oxygen has diffused into the muscles and is now depleted of O2. Then it must return to the lungs. 17. What is the arterial PCO2 arriving at the peripheral tissue? 40 mmhg that has been oxygenated and has a lower CO2 level. 18. What is the venous PCO2 level leaving the peripheral tissue? 45 mmhg and the PCO2 level is increased because the oxygen has been unloaded into the tissue and now must return to the lungs to be re-oxygenated. 19. Why is the Bohr effect beneficial? Respiring tissues have a high concentration of carbon dioxide (a by-product of respiration). As a result, more oxygen will be released in these areas due to the Bohr effect. This is beneficial as it provides more oxygen to the respiring tissues and allowing them to continue respiring. 20. What happens if you increase blood flow to the peripheral tissue? PO2 level increases and PCO2 level decreases. PCO2 levels increases and PO2 level decreases. 22. What is the hemoglobin carrying capacity for an anemic person? 1.34ml 13 ml 10 grams. 23. What does the flat portion of the Hb curve mean? Oxygen binds tightly to Hb at high PaO2. Over wide range of high PaO2 (60 – 100 mm Hg), hemoglobin remains highly saturated. 24. What does the steep middle portion of the curve mean? Oxygen binding is cooperative once 1 molecule binds/unbinds, others bind/unbind easily. Oxygen “unloading” (moving from blood to tissue) is facilitated between 40 – 20 mmHg. 25. What does a shift to the right mean and what causes a shift to the left? A shift to the right means that the PO2 level has decreased and oxygen needs to be unloaded. An increase in homeostasis (H+), CO2, temp, BPG will cause a shift to the right. A shift to the left would mean a decrease in any of those. 26. What are the 3 ways to increase oxygen delivery to the peripheral tissue? Increase blood flow, increase O2 extraction at the tissue, and shift the Hb O2 curve to the right. 27. What is carbon monoxide and what are its binding properties? Carbon monoxide (CO) binds O2 with 20 times more affinity than hemoglobin does. Partial pressure of CO is very low and will cause blood to still appear red as the O2 cannot unload. 28. What are some signs of carbon monoxide poisoning? Shortness of breath, nausea, headache, dizziness, and confusion. 29. How is carbon dioxide transported in the blood? It is 70% bicarbonate ion (HCO3-), 23% is carbon hemoglobin and 7% is dissolved. 30. Which vessels perform a normal physiologic shunt? Bronchial venous drainage (pulmonary vascular system) and Thebesian veins (left atrium). 31. What are the normal hemoglobin values? For male: 14-16 per 100 ml of blood, for female: 12-15, and for infant: 14-20. 32. What percentage of carbon dioxide is transported if dissolved? 33. What percentage of CO2 is transported in the plasma? 34. What percentage of CO2 is transported by RBC? It is the low or inadequate oxygen for aerobic cellular metabolism. 36. What are the 4 categories of hypoxia? Hypoxic (hypoxemic) hypoxia, anemic hypoxia, circulatory hypoxia and histotoxic hypoxia. It is the abnormal low PaO2. 38. At what level of reduced hemoglobin will cyanosis appear? 39. What is the value of a normal anatomic shunt? 40. What is the function of carbonic anhydrase? It speeds up the chemical reactions regarding carbon dioxide. 41. What are the hematocrit values indicating polycythemia in men and women? For men: more than 52% (norm: 45) while for women: more than 48% (norm: 42). 42. What are the hemoglobin values indicating polycythemia in men and women? For men: greater than 18.5 g/dL (norm: 14-16) and while for women: greater than 16.5 g/dL (norm: 12-15). 43. What are normal hematocrit levels in men and women? For men: 45% and for women: 42%. 44. What causes a capillary shunt? Alveolar collapse (atelectasis), alveolar fluid accumulation, and alveolar consolidation. 45. What is a true shunt? Anatomic shunt + Capillary shunt. 46. What is the definition of a shunt? It is when blood bypasses the oxygenation phase. 47. What factors shift the oxyhemoglobin curve to the right? Decreases pH and increases PCO2, temperature, and BPG. 48. What factors shift the oxyhemoglobin curve to the left? Increases pH and decreases PCO2, temperature, and BPG. 49. How is the majority of CO2 transported as? It is transported from the tissue through the lungs by bicarbonate. 50. What percentage of CO2 is transported by bicarbonate? 51. How is CO2 transported in plasma? Carbamino compound (bound to protein), bicarbonate, and dissolved CO2. 52. How is CO2 transported in red blood cells? Dissolved CO2, carbamino- Hb, and bicarbonate. 53. What is the result of venous admixture? Reduced PaO2 and calcium peroxide (CaO2) returning to the left side of the heart. 54. Which part of the dissociation curve illustrates the safety zone for oxygen loading? The flat portion between 90-100%. 55. What does the steep portion of the oxyhemoglobin curve have on oxygen delivery? The diffusion from the hemoglobin to the tissue cells is enhanced. 56. How does the Bohr effect change the shape of the hemoglobin dissociation curve? The hemoglobin dissociation curve shifts downward to the right which indicates that hemoglobin has a lower saturation with oxygen. This shift is called the Bohr shift. 57. What will happen to P50 when the curve shifts to the right? 58. What will happen to P50 when the curve shifts to the left? 59. What is a normal P50 reading? 60. What is oxygen affinity? The tendency of a molecule (in this case hemoglobin) to associate with oxygen. 61. Why is hemoglobin a good vehicle for oxygen? It has a high affinity for oxygen. 62. What is the structure of hemoglobin? Four sub-units consisting of a polypeptide chain and a heme prosthetic group and each heme group contains an Fe²⁺ ion. 63. How many oxygen molecules can one molecule of hemoglobin associate with? 64. How does hemoglobin enable the fast diffusion of oxygen into the erythrocytes? Once bound to the hemoglobin, the oxygen molecules are taken out of solution keeping the concentration gradient steep enough for oxygen molecules to diffuse into the erythrocytes quickly. 65. What is the word equation for the association of hemoglobin with oxygen? Partial pressure of oxygen – essentially the concentration of oxygen. 67. What is PO₂ measured in? 68. What is the general trend of the hemoglobin dissociation curve? As PO₂ increases, so does the level of hemoglobin saturation. 69. What is hemoglobin saturation? The amount of oxygen bound to hemoglobin in proportion to the amount of oxygen the hemoglobin can carry. 70. How is hemoglobin saturation expressed? 71. What happens to hemoglobin at a high PO₂? Hemoglobin associates with oxygen to form oxyhemoglobin. 72. What happens to hemoglobin in the lung capillaries? 73. Why does hemoglobin in the lung capillaries have almost 100% oxygen saturation? The lungs have a very high PO₂ because they take in oxygen from the air. 74. What happens to oxyhemoglobin at a low PO₂? Oxyhemoglobin dissociates into hemoglobin and oxygen. 75. What happens to hemoglobin in respiring tissues? 76. Why does hemoglobin in the respiring tissues have a very low oxygen saturation? The respiring tissues have a very low PO₂ because they use more oxygen during respiration – they also have a high CO₂ concentration which induces the Bohr effect. 77. What shape is the hemoglobin dissociation curve? S-shaped – shallow at first, then steep and then shallow. 78. Why is the hemoglobin dissociation curve shallow at a low PO₂? At a low PO₂, most Hb molecules have not yet associated with an O₂ molecule as there is not much O₂ to go around. It is more difficult for Hb to associate with the first O₂ molecule because the heme groups are still in the center. The saturation level remains low as most Hb molecules will not readily associate with O₂ and there is not much O₂ to go around anyway. 79. Why does the hemoglobin dissociation curve steepen as the PO₂ rises? At a higher PO₂, more Hb molecules have associated with an O₂ molecule as there is more O₂ to go around. Once the first O₂ molecule is bound to a heme group, the Hb molecule undergoes a conformational shape change which increases its affinity for oxygen. As the PO₂ rises, more Hb molecules have one O₂ molecule already attached, so they have a higher oxygen affinity and will associate readily with O₂. This increases the saturation level as hemoglobin will readily associate with O₂ and there is more O₂ to go around as well. 80. Why is the hemoglobin dissociation curve shallow at the highest PO₂ levels? Once the Hb approaches 100% saturation, there are increasingly fewer unsaturated Hb molecules around to associate with O₂. 81. How does oxygen bind to hemoglobin? Each of the Fe²⁺ ions in the four heme groups associates with one oxygen molecule. 82. How does fetal hemoglobin differ from adult hemoglobin? It has a higher affinity for oxygen. 83. Why is the fact that fetal hemoglobin has higher oxygen affinity useful for the fetus? Oxygenated blood from the mother is delivered through the placenta which has a low PO₂. In these conditions, the mother’s adult oxyhemoglobin dissociates and releasing oxygen. Meanwhile, the fetal hemoglobin will be more readily associate with oxygen. 84. How is the fetal hemoglobin dissociation curve different from the adult hemoglobin? It shifts to the left. 85. Why does carbon dioxide need to be transported and why is the cardiovascular transport system needed? To prevent harm caused on CO₂ build-up in the body’s respiring tissues. 86. What are the three ways on how carbon dioxide is transported in the blood? 5% is dissolved in the plasma as CO₂ molecules, 10% associates with hemoglobin to form carbaminohemoglobin, and 85% is dissolved in the plasma as hydrogen carbonate (HCO₃⁻) ions. 87. What is the formula for hydrogen carbonate ions? 88. How do the hydrogen carbonate ions move out of the erythrocytes? The HCO₃⁻ ions diffuse out of the erythrocytes into the plasma. Chloride ions (Cl⁻) move from the plasma into the erythrocytes to maintain the charge inside them. This is called the chloride shift. 89. Why does the pH of the erythrocytes’ cytoplasm become more acidic in high concentrations of carbon dioxide? Because carbon dioxide reacts with water to form carbonic acid, which itself dissociates into H⁺ ions and HCO₃⁻ ions. It is the H⁺ ions which lower the pH of the erythrocytes’ cytoplasm. 90. What is the Bohr effect? The effect of increased CO₂ concentration on hemoglobin – namely, it lowers the hemoglobin’s affinity for oxygen, causing oxyhemoglobin to dissociate to release oxygen. 91. How does the Bohr effect take place? CO₂ enters the erythrocytes. It combines with water to form H₂CO₃, which dissociates to release H⁺ ions and HCO₃ ions. The H⁺ ions lower the pH of the erythrocytes’ cytoplasm. The change towards a more acidic pH alters the tertiary structure of hemoglobin, reducing its affinity for oxygen. The hemoglobin is unable to hold as much oxygen as before and releases it. This means that the hemoglobin is available to associate with H⁺ ions and form hemoglobin acid in order to raise the pH to normal levels. So there you have it. You can use these study guide and go through all the practice questions to gain a complete understanding of the process of oxygen and carbon dioxide transport. I hope this information was helpful for you, and I know if you truly learn and understand it, you will be in good shape now and for years to come. Thanks for reading and as always, breathe easy my friend.